Living in Orlando, one of those uber market research cities, I was often invited to sit on a product testing panel. The kids were little, money was usually in short supply, and I would be paid up to $75 – really! – to spend a couple hours eating food and dissecting its market potential. What could be a better way to spend a little time away from the wee bairn than getting paid to eat??? Talk about a win/win situation! 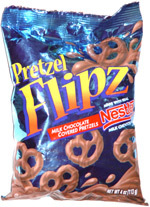 Mostly, the products were forgettable, but one I do remember eating is the prototype for what would eventually become Nestle’s Pretzel Flipz. ANYWAY, the person directing discussion of the nifty chocolate covered pretzels asked why we thought these might sell well, and many offered the usual mundane comments. Everyone loves chocolate. You can’t go wrong with chocolate. Crunchy and sweet. Crunchy chocolate – hooray! Yada yada yada. Being one of those rare humans who neither favors salty or sweet, I mentioned that its selling point would be that it blended salty and sweet. Like Snickers. Like Peanut M & M’s. Like that. Now, I like salty. And I like sweet. But what really makes me happy is when they are combined together. Like Snickers, or Peanut M & M’s. Salted Caramel. Understand? Personally, I think the Flipz are just okay. But hey, I made $50 to give my opinion, not buy them off the grocery shelf. I can live with that. Which brings me to what I’m really writing about today – my Chex Mix. So, you say, everybody eats Chex Mix. The General Mills version, or some other one of their own making. Mine is of my own making. What makes it different, you ask? Well, just guess… Bingo. You’re correct. I make it sweet. And salty. It all started when our family went camping for the first time, ever. Ever ever. I wanted to make some snack that wouldn’t be gone in, oh, say, 10 minutes. I wanted something that would last. So I thought of Chex Mix. But I don’t particularly like pretzels in mine. I’m not a fan of those little breadsticks that come in the pre-packaged version either. So I thought I would make it out of what our family likes. Instead of pretzels – goldfish. Instead of salty peanuts – honey roasted ones. Instead of breadsticks – M & M’s! Now if we’re camping, my family won’t even let me out of the house unless this Chex Mix is made. My son besieges me from school to send it in care packages. It’s got salty. It’s got sweet. A little bit of both for everyone, especially me, who likes salty and sweet, particularly together. Strange human that I am. Preheat oven to 325 degrees. Mix Chex cereals and goldfish together in a large roasting pan. In microwave container, melt butter. Add Worchestershire sauce and season salt. Mix thoroughly together. Pour a little of the butter over cereal mixture a bit at a time, stirring to coat. Place in oven for 1 hour, stirring every 15 minutes. Cool completely. Pour cooled cereal mix in a VERY large bowl (you may need two!). Add in nuts, dates, golden raisins, M & M’s, and Reese’s Pieces, mixing well. Eat away – it makes TONS!!! *Side note, here…. We love dates in our family, but we’ve had guests that picked them out. Also, this works fine with regular raisins, but the golden ones tend to be a little plumper and not so dry. We’ve added Jelly Bellies before, and many other odds and ends, but we always come back to this recipe.